I spent most of my day today looking into language schools around Pattaya. The better known schools all have offices located around CarreFour on Pattaya Klang in central Pattaya. The three language schools that I inquired about today were Callan & Walen, Pro Language and PLC. All three schools had very nice and well informed staff and all offered a free class to get a feel for their teaching methods. These three schools are approved by the Ministry of Education and all offer a 1 year student visa course of 180 hours. The price for 1 year student visa course is relatively the same at all the schools with the tuition being at or close to 25,000 baht. Today I gathered information and sat in on a couple of classes. Tomorrow I will sit in on more classes and then I think I will have a much better idea of which schools teaching methods will be the best for my particular learning style. While the 1 year student visa is important for my plans here in Thailand, learning the Thai language is paramount and I want to make sure I make the right choice. You can read my review of the various Thai language schools in Pattaya over at Women Learning Thai and Some Men Too. Thai Language Schools in Pattaya. Wonderful step to take. Learning Thai, and practising daily, is a rewarding & delightful experience..
BTW, did you change your blog format to 3 columns ? Seems very hard to read. Joe, had an error in the backend that screwed up the front page…should be better now. 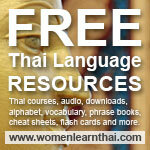 Talen, I am SO chuffed at your Thai language venture! And so fast as well. You just landed in Thailand. Megga! I applaud you. In anticipation, I’ve ramped up mine too. There is something about buddies going the same route that gets the brain cells totally howling. But as a cat, I’ll roar. Way to go. Good luck with the kor kais, gor gias etc, mind spinning to say the least. Talen I shall be following your progress on this one with interest. Good luck, I’m sure it will be worthwhile. Camille, I’m going to need all the luck I can get but hopefully I’ll be able to put some sentences together soon. Mike, I know in the long run it will definitely be worthwhile I just hope I am a better student than I was many long years ago. Talen you’ve touched down and hit the language schools running, and in Pattaya as well. I think I’d be on my fourth or fifth packet of paracetamol by now. Only kidding, alcohol doesn’t seem to give me major hangovers or headaches. Fair play to you for approaching your first few weeks in a sensible fashion as I know the urge to party in Pattaya is massive. Good luck with your classes and I’ll look forward to your reviews on WLT. Martyn, being sick the first week helped me to maintain focus. Have been out a few times but I have to make sure I keep my nose to the grindstone. Don’t want to wake up a year from now and realize I have wasted the time. try again. not sure if your comments area can take Thai words. The pieces will all come together. Just some motivation to master the vowels then consonants. Looking back in 6 months, you will be breezing thru any words they throw at you ! I eventually went with Pro Language and I am very happy with my decision. The teachers are great and I am learning a lot. When you move to Issan you’ll also be hearing whats called the Issan language which is a contrast of Thai, Cambodian and Laos…you’ll have a lot to learn. Thanks Talen, I am quite near to the Pro Language school, so I will probably check them out first. Yes, I will have a lot to learn ha ha. Many thanks, who knows I may well se you there.